I spent an afternoon at the Royal Ontario Museum (ROM) in Toronto, Ontario, Canada recently as I wanted to view the Byzantium, Rome, Egypt, Nubia, Bronze Age Aegean, Ancient Cyprus and Greece exhibits. The ROM is the next best place, outside of the countries themselves, that is easily available for me to view the artefacts of these cultures. The last time I went was well before my undergraduate years, and I remember leaving with a feeling of having gained an abundance of knowledge about the cultures. Now that I have gone back as someone who has spent some time studying a number of these peoples, I see how little information is truly given in museum displays. In spite of this it was enough to whet my appetite to find out more when I was younger, and so would do this for many other visitors as well. In this regard the ROM does its job of informing the public very well, but this is not necessarily the case for the scholar or graduate student. The artefacts shown are fascinating as items by themselves, without any context, and they do a good job of only giving the basic facts about the item on display with the intent of not misleading visitors, which I give them credit for, but unfortunately it makes it hard to put a single item, such as a gold wreath or a piece of pottery, into any kind of cultural context for a further understanding. 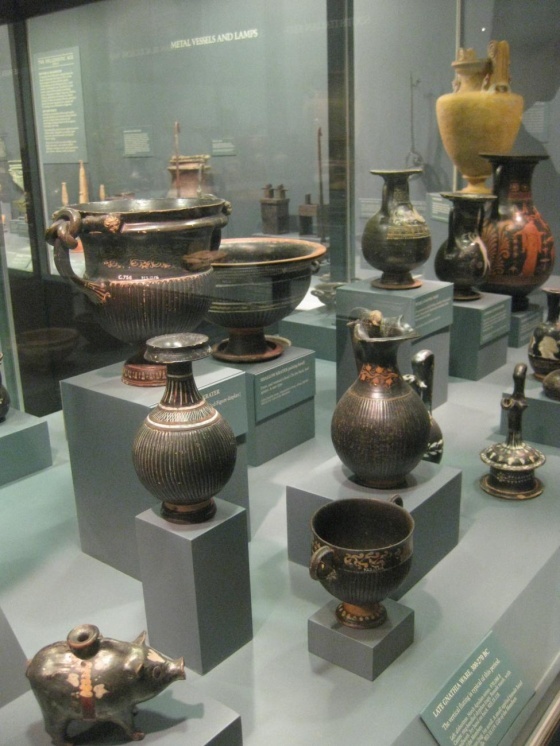 It is helpful if you have researched, even just a cursory study, the culture relating to the artefact, as this will help you fill in vital information that can then allow you to feel a bit of a connection with the artefact itself. In the museum there is just not enough information to really LEARN about the culture and that is something, no matter how large of an undertaking, that I would love to see. Visitors can learn tiny snippets here and there, such as the Attic black and red-figure vases and the fact that not many of them were signed by their makers. I would have to say that the Attic vases were one of the best explained artefacts, as it even suggested the viewer read J.D. Beazley’s Attic Black-Figure Vase-Painters, and Attic Red-Figure Vase-Painters books in order to learn about the style and its terminology. Items such as statues, or remains of statues were pretty much stationed on their own. I would love to see the provenance of these artefacts stated. Where did they come from? Where were they found? Do we have any idea about what they were used for? If we are just using an educated guess as to what they were used for, then state that as well. Seeing the artefacts, both real and replicas, leaves me with a sense of wonder, but then again, after studying the cultures (even just a little bit) I am able to get more out of the visit then I would as a visitor. Seeing artefacts in a museum setting leaves me with a wish that I could go back in time and see these artefacts being used in everyday life, which I am sure many scholars and students alike share. Unfortunately, since that is not an option at this time I will choose to take the next best thing and continue to study the cultures in the hopes of understanding even a small amount about these fascinating ancient people, be they Greek, Roman, or Egyptian! Hi, feel free to share. We hope you continue to find our content interesting.